Every artist's studio needs the Martin Universal Mobile Art Organizer, which provides not just storage for your supplies but a convenient extra work surface that rolls wherever you need it. Measuring 28¾"H × 13"W × 16"D, this taboret has a modern, angular, metal frame with a matte Black baked enamel finish and laminated panels with a birch look. 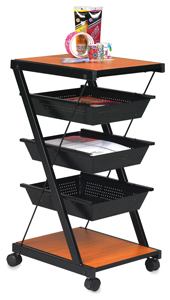 Three 9" × 12" open metal drawers give you easy access to art materials. This handsome organizer coordinates well with many easels, drafting tables, and craft/hobby centers in any studio, home, or office. ™ Martin is a trademark.